I originally wrote this review for Theology Gaming (so you won’t find our usual emphasis on Biblical parallels and content warnings). Many thanks to that site for the opportunity, and now allowing me to share it with you…. *Please note: the text issue users have reported when playing on PS4/larger screens still hasn’t been fixed. If you’re holding out for that patch, you might want to wait a little longer. Armello is perhaps the purest expression we’ve seen in gaming of an original, digital board game (Editor’s note: some body need to play Culdcept :). Making a title that can be played over and over while retaining a level of simplicity, surprise, and depth is a daunting task–let alone having to do so without the basic charm of handling physical cards and items. 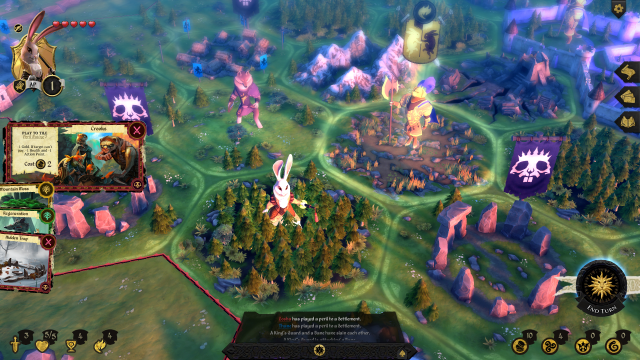 Amazingly, Armello thrives in this situation, using the abstraction and possibilities of computer-grounded systems to weave an experience that couldn’t be realized anywhere else. 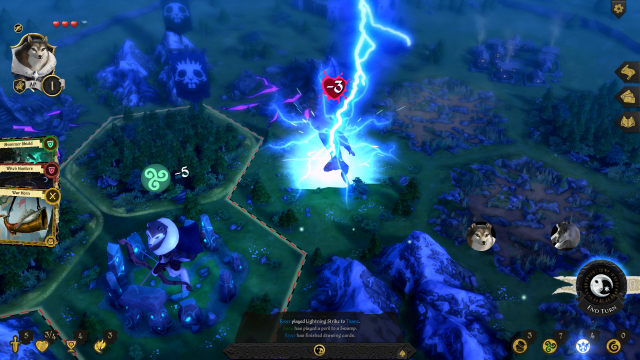 Like the best of board games, Armello offers an absorbing play space where winning and losing is second to the path you find along the way, allowing you to express yourself in how you interact with others. Will you ignore quests, risking life, limb, and victory to laughingly derail a friend? Begin an unsteady alliance with a competitor to challenge a clear contender? What does this say about you? And is it possible, amidst a jovial stream of Immolation and Lightning Strike spells, to somehow build relationships? Armello follows the journey of 4 diverse heroes (out of an available 8) attempting to take the throne from their corrupted, dying King. To do this, players will complete quests and murder one another on procedural generating hex-grid maps filled with valleys, mountains, forests, swamps, mysterious stone circles, settlements to capture, and dungeons to explore. Cards which you can equip and deploy constitute each player’s “inventory,” and come in 5 varieties: Items, Spells, Trickeries, Followers, and Treasures. Combined, these elements and the strong, overarching goal of somehow usurping the mad King of Armello form a rich foundation that allows the management of a few easy-to-understand variables to influence every aspect of the game. This has the side effect of making the course of each match wildly divergent. Equipping your adventurer with Item cards costs Gold, but spending this gold preemptively may mean you won’t be able to pay the King’s tax (if his Adviser suggests he levies one). The position of King’s Adviser is determined by who holds the most Prestige, which is gained by collecting bounties, killing opponents, and completing quests. However, instead of aiming to become the King’s Adviser, one can spend their Prestige on influencing the King’s forces, or stealing from their enemies. Magic allows you to use powerful Spell cards, but effort spent hoarding this resource will be undone as nightfall approaches and the land of Armello balances its energies once more. Some cards, while holding fantastic abilities, actually corrupt you with the same Rot afflicting the king. Continued use and gaining more Rot will, while conferring certain benefits, force you to kill others to regain your health even as the corruption slowly kills you each dawn. 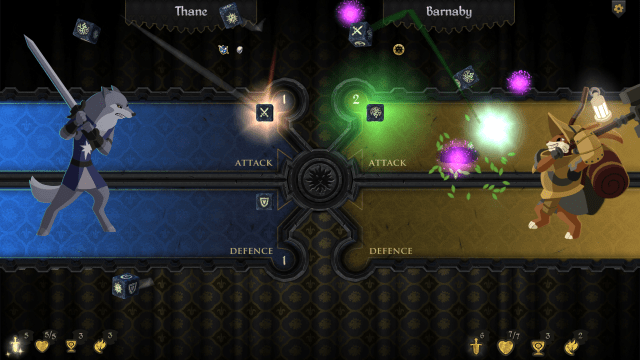 The Battle screen of Armello–this is where your Items, Followers, and unique hero statistics really come into play. Oh, what an overly-detailed hole this review has fallen down! Armello’s gorgeous art and sparse emergent storytelling is a joy, but a network of interlocking systems, constantly changing allegiances/personal goals and small, meaningful decisions are what truly makes it shine. My complicated attempt to describe the depth of the experience the game provides, yet manages to make feel so simple in practice can tell you as much. However, what really fascinates me about Armello is its potential capacity to foster relationships. I was interested in seeing if this effect could translate to a virtual space, when watching an opponent’s reaction to your move wasn’t as easy as looking to the side. 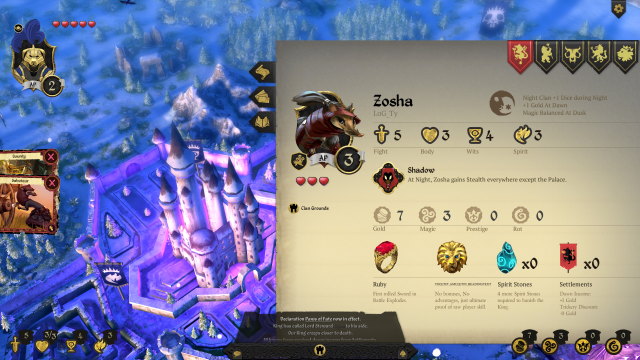 Armello contains a number of layers and gameplay systems I didn’t even touch on, yet manages to condense and clarify most of that information in simple interfaces like that pictured. For the past month, I’ve played Armello with a game developer I had corresponded with only casually on Twitter, and found Armello retains the ability of tabletop games and video games around the world to bring people together. In what was a casual acquaintance, I found a fantastic rivalry. Swapping stories, experiences, and bits of our daily lives (he in Australia and I in South Korea), our fuzzy animal avatars beat the crap out of each other late into the night until an AI controlled character swooped in and ‘plinked’ the king to death with her special ability, winning the game. It was shocking, embarrassing, and…We couldn’t stop laughing. After all–that’s what friends are for, right? Lightning Strikes and Immolation spells were frequently used in our games…Not a surprise. This entry was posted in Uncategorized and tagged Armello, board game, christian, friendship, Guest Review, Nelson, review, Theology Gaming, video games and the Bible. Bookmark the permalink.